So when I recently caught myself craving a certain salad, which has never before happened in my 34 years, I of course felt compelled to share it with all our facebook fans. And I also asked them about their favorite salad combinations as well (below) because I’ve learned that not all salads are created equal. Over are the days of somewhat soggy iceberg lettuce pieces topped with stale looking carrots and a side of highly processed salad dressing. If you start with some fresh greens and top them with the perfect mix of “accessories” I am learning that salads can actually be kind of good. And if we really come up with a super tasty combination of accessories my kids might even have a little salad, too. So here are some ideas to keep us all from getting burnt out…and as always leave any additional suggestions you might have in the comments below! 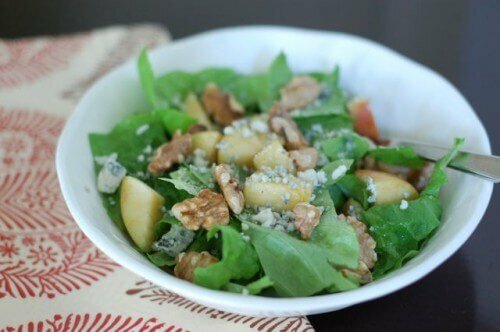 Mixed greens with apples, toasted walnuts, blue cheese, and olive oil (pictured above)…the salad that inspired this post! Broccoli, cauliflower, grape tomatoes, cheese (cubed small), green onion, cucumbers, bell peppers, and natural sunflower seeds tossed with olive oil & balsamic vinegar. I also like cucumbers, thinly sliced onions, tomatoes, and bell peppers marinated in red wine vinegar with a splash of olive oil. Can add a little sweetener if you want, but I like it without. with a little bit of fetta cheese(grilled chicken is an option too if not vegetarian).It is bulgarian “shopska salad”. My family loves fresh romaine, shredded cheddar, black beans, tomato, red onion, avocado, bell pepper, corn, and homemade ranch dressing. The canivores in the family like to add grilled chicken breast. We call it Santa Fe Salad. Yum! I’ve also just discovered a salad with very fine-cut curly kale, thinly sliced cabbage with a dressing of olive oil, and a combo of cider vinegar, balsamic vinegar and red wine vinegar. Play around with the dressing proportions until you get it to your liking. This is really good. I never liked curly kale because it never seems to break down, but when you chop or shred it finely, it’s just crunchy! Lots of other great salad ideas on here we’ll be trying at home. More often that not we don’t get through the greens we buy before they start to go bad so these are good inspiration! That’s my favorite Greek dressing! Love it! I used to work for a woman cleaning her house. She would make me lunch every day. She often made me a tuna/ garbanzo bean salad. It sounds gross, but it was good! 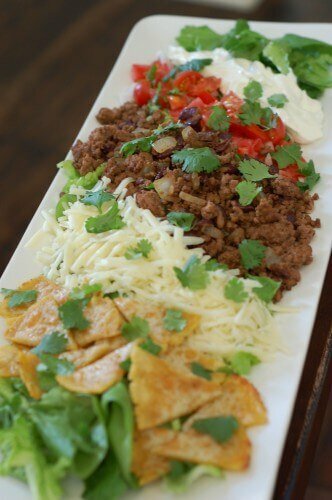 You can also make salad appetizing and healthy by mixing your favorite food into a salad, like chicken fingers, hamburger or even pizza pieces! 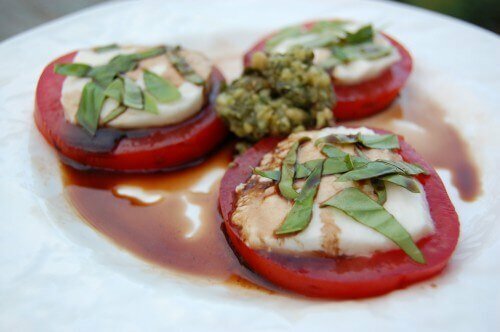 Great post….I want some caprese salad right now! My favorite salad may sound crazy, but my favorite restaurant does it and I make it at home. It’s great! It’s called “West by God,” and it’s mixed greens, tomatoes, and cucumbers topped with blue cheese, sliced steak, toasted pecans, and FRENCH FRIES. I make my own baked fries at home: http://wp.me/p1n4yp-cZ and I also add dried cranberries to my salad. It’s great with homemade ranch dressing! Our favorite â€œmain courseâ€ salad is: a mix of spinach, baby greens, and romaine, corn, black beans, cherry tomatoes, black olives, red or green onion, red bell pepper, carrots, avocado, cilantro, a little cheese, topped with a few tortilla chips, grilled (or rotisserie) chicken and a chipotle cheddar dressing. I crave this salad often! Hold the chicken to make it a delicious side salad. I make a salad with chicken, glazed walnuts/pecans, dried cherries, and bleu cheese. I make my own dressing out of unsweetened apple sauce, red wine vinegar, dijon mustard (is that Real? ), and black cherry juice. It’s wonderful! Having had a gastric bypass I can’t eat a great deal at any one time. Since my priority is protein I like to make a salad that is loaded with kidney beans, garbanzo beans, cheese, sometimes chicken or bacon on a light bed of greens. Salad doesn’t have to be all greens! I’m so glad that you’re still experimenting Lisa! Romaine, pears, shaved Parmesan, and a raspberry vinagrette. Oh, so good. Run some fresh brussell sprouts through the food processor so they are shredded. Add some sliced strawberries, blue berries, parmesian cheese and Brianna’s Blush Wine vinagarette dressing. Amazing, and an excellent way to sneak some brussell sprouts into your kid’s dinner. My favourite salad is arugula with pear slices, warm portabella mushrooms, shaved parmesean, and a light oil and vinegar dressing with a touch of honey and lemon. The mushrooms wilt the arugula a little bit, and it’s interesting to change up the typical salad with a bit of warmth. I started making a new salad dressing this week that was fantastic – a little olive oil, sesame oil, fresh chopped garlic, fresh lemon juice, splash of low sodium soy sauce, dash of curry powder, rosemary. The curry powder totally makes it! I love using walnut oil and pomegranate balsamic vinegar as an easy salad dressing. I just pour a bit of each right onto the salad and mix it up with tongs. (Start light on the balsamic – you can always add more!) It works really well with pink lady apples, spring greens, walnuts and pomegranate seeds. Goat cheese is a great addition, too! I make my own seasoning mixes, Greek, Italian and ranch to name a few. When I go to dress my salad I add the oil and vinegar and then sprinkle the seasoning on top and mix it all together. For the ranch I like a mixture of buttermilk an sour cream ,no sugar. I add my ranch seasoning mix to the buttermilk/sour cream mixture. I keep a variety of flavored vinegars on hand, by changing up the ingredients you can have salad every night and never repeat the same salad twice. Salad like soup can be as simple as what you have in the refrigerator and a great way to use up left overs. I didn’t see the classic salad nicoise(sp?) a great way to use up green beans and boiled potatoes . Thank you for posting this! I eat a salad everyday for lunch and need more variety! I might print this out and use it as part of my grocery shopping list! Did thinly sliced fennel make the list? It’s sweet and crunchy. Great with chopped green onion, red cabbage, clementine segments and toasted almonds. Salads are a great way to get in a couple servings of vegetables as well. And homemade dressing is the absolute best. I am SO not a salad person either, and probably could not eat a salad as a main course, ever, but my favorite side salad lately has been: romaine lettuce, red onion, orange slices and a red wine vinegar, olive oil and honey dressing. Super easy and good! 1) Arugula, artichoke hearts, garbanzo beans, and dressing of choice. Also good with dried cranberries and/or tart apples. 2) Spinach, beets, cucumber, red onion, and feta with dressing of choice. I had a great salad at A16 in San Francisco- arugula, shaved Romano cheese, chopped dates, and toasted almonds with an olive oil/lemon juice vinaigrette. Wow! What an incredible list! I love salads, but my family are not big fans. I’m sure to find some good ones to try on them here. Thanks for all of the hard work and great ideas! I typically use olive oil and balsamic vinegar on my salad, but I recently made some of your berry sauce to use with yogurt and my husband has been adding a little to his salad with the vinegar and oil! It’s really good! This is a great Salad List- I am a salad lover especially when made with extra virgin olive oil and real lemon juice Thanks for the hard work – Keep it up Wow! Thank you for this list. I do like salads, but I am not too creative when it comes to food. So I buy greens and get bored. This is the best list of ideas I have seen. I love the whole ideal of real foods. I often say we need to eat only what GOD gave us naturaly. I was looking for a easy recipe for italian dressing. Anyone have one. Thanks in advance. Do you dry your own cranberries or can you tell me what brand you have found that doesn’t include sugar? My favorite right now is mixed greens, feta cheese, and pomegranate seeds. Yum! Always looking for something different, though! I made a salad last night that was yummy good. The original recipe calls for small shell pasta and I switched it out for whole wheat pasta. I also think broccoli would be good in place of the spinach and you can put in any kind of cheese that you prefer. There are only two of us so I cut the recipe in half. Cook pasta according to package directions. Steam spinach in just the water that clings to it for a few minutes in a tightly covered saucepan. Remove from the heat after the spinach wilts. Toss the spinach with the pasta; top with tomatoes and olives. Combine remaining ingredients (except Feta) for salad dressing and pour over the salad. Top with the crumbled feta cheese and serve.